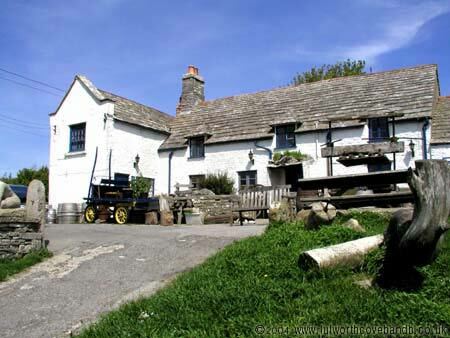 The Square & Compass at Worth Matravers near Corfe Castle is a free house and beer is served straight from the barrel behind the bar – sorry serving hatch! Food is very limited but is good and home made. It also has a museam of fosils etc. found by local quarymen and the owner, it also has various Purbeck stone sculptures outside. The views across the ancient field systems down to the sea at Windspit are nearly as good as the pint of beer in your hand! Get there early it gets very busy at peak times! 30 minutes drive from Lulworth Cove.